Remember the function served by plants and structures is more important than their appearance. In other words, don't base your planting decisions solely on what a plant looks like. 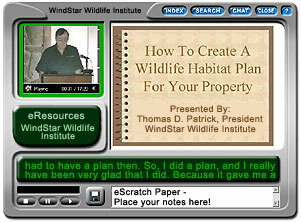 Following are WindStar Wildlife Institute's plant recommendations for wildlife habitats in North Carolina. The eastern two-thirds of North Carolina is characterized as coastal plain and tidewater. Moving west, the next two-fifths of North Carolina, about 200 miles wide, consists of a piedmont plateau. In the west, the land slopes upward from gentle to rugged rolling hills to the high southern Appalachian Mountains containing the Blue Ridge and Great Smokey Mountains. The North Carolina Wildflower Preservation Society can provide lists of plants for a specific region.